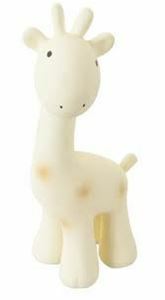 One of the most popular toys on the market, this adorable giraffe rubber teether is a toy to cherish. It is so tactile and the perfect shape and size for little hands to hold and play with. It is made from natural rubber that is harvested sustainably from rubber trees. It has a little bell inside that will delight the baby. It is suitable for newborn babies. Stands 17cm high.